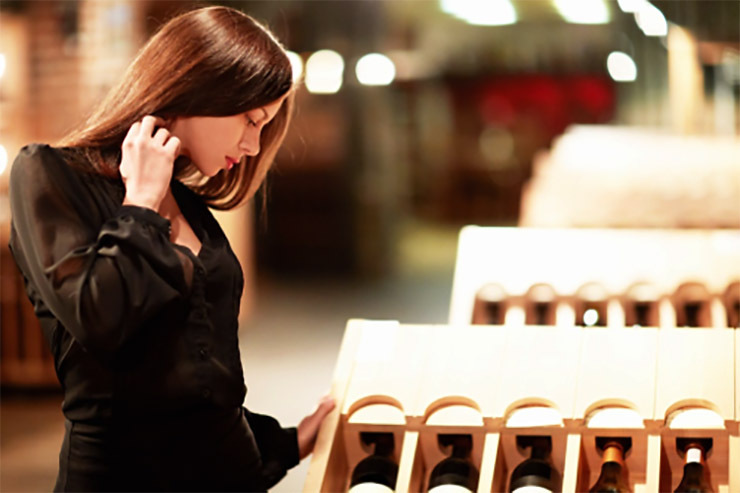 Get the answers to your questions about buying wine, serving wine, tasting wine, storing wine and much more with our Wine FAQs. What Makes Some Wines “Better” Than Others? The way grape vines and their fruit are handled throughout the growing phase can make a big difference in wine quality. When growers pay close attention to the vine, keeping it disease free, and rush delivery of only the ripest grapes to wineries, they help insure a better tasting and more aromatic wine. From grape selection to bottling, the winemaker’s task is to maximize the quality of the end product. Overall wine quality depends on how the grapes are processed during crushing and fermentation, temperature control, and the type of barrel used in aging. Lesser quality wines are typically produced in enormous quantities and are processed using harsh treatments that can spoil the flavor. More expensive wines are developed in the tradition of terroir, barrel choice and time. Since great wine is made in the vineyard, the location of where the grapes are grown matters quite a bit. Some of the best vineyards tend to be in areas where the vines struggle to produce grapes. This results in reduced yields and a more intense tasting wine. The world’s most coveted wines are aged in oak barrels. Why? Because oak adds a mash-up of flavors to wine that range from vanilla, clove and nutmeg to dill, dried fruit and brown sugar. Oak barrels also expose the wine inside to oxygen, which reduces the intensity of tannins, leaving a smooth finish. Only two barrels can be made from an oak tree, and those produced in France are much more in demand than those made in the U.S.A.
Time changes everything for wine, from the taste of the fruit flavors to the reduction of acidity and tannins. “The older the better” is certainly true for red wines. When well aged, reds deliver a subtle flavor that leans more towards dried fruits with a round finish. Expect older wines to cost more not only because they’ve been aged to perfection, but also because they’ve been taking up precious space at the winery. When is Wine at its Peak? Well, that depends on a lot of things: the wine itself, how it was stored, and the preferences of those drinking it. Only a small percentage of fine wines actually benefit from long-term aging so most wines are best enjoyed within a few years of their release date. In fact, most of the world’s wines are meant to be consumed young. And though a wine is always safe to drink past its recommended drink window, open another bottle if the wine you’re pouring tastes faded or has completely oxidized. Ultimately, judging whether a wine has gone past its peak flavor is really based on your own tastes and experiences. Check out interactive guide to How Long Wine Lasts. Heat is the number one enemy to a bottle of wine. Temps in excess of 70° F will age a wine, fast! Ideally, you’ll want to store your wine between 45° F and 65° F to insure the best flavor. If it gets much hotter, your wine can actually “cook” from within, resulting in a flat flavor and aroma. If it gets much colder, there’s a risk the cork could dry out, which might allow air to seep into the bottle and damage the wine. And if the wine freezes, there’s a chance the liquid could expand enough to push the cork out entirely. While conventional wisdom says that the ideal humidity level for wine storage is 70%, anywhere between 50-80% is considered safe. Conditions that are too dry can shrivel the cork and allow air to seep in and spoil the wine. Too wet, and now you’re battling mold. Not necessarily a wine killer, but mold will ultimately damage the labels leaving them unrecognizable. If heat is a bottle of wine’s enemy, extreme, rapid or frequent temperature changes is its true nemesis. Along with flat, “cooked” flavors and aromas, the unexpected expanding and contracting of the liquid inside the bottle can push the cork out, causing seepage. So aim for consistency but remember, a little seepage may not mean all is lost. Open that bottle anyway and give it a taste before deeming it inferior. Chances are it’s still delicious. It’s okay, wine isn’t afraid of the dark. In fact, it’s just the opposite. That’s because light – especially sunlight – can degrade and cause your wine to age prematurely. This is one of the reasons vintners use colored glass when bottling their wines. Household lights, from incandescent to fluorescent bulbs, probably won’t damage the wine itself, but can cause labels to fade over time. 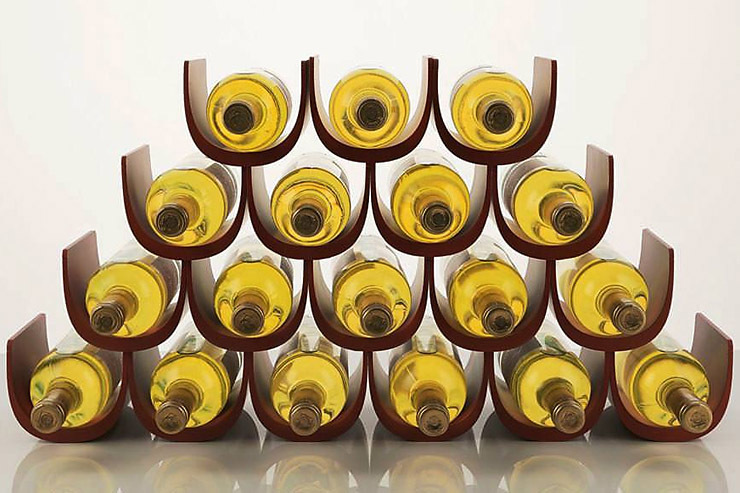 Theoretically, it makes sense to store your wine bottles horizontally. It allows the liquid to rest against the cork – keeping it from drying out – it’s space-efficient, and it certainly won’t harm your wine. However, if you’re planning on drinking stored wine in the near future, or if the wine has been bottled with an alternative method like a screw cap, it’s not necessary. Feel free to line your bottles up vertically. For more information on the ideal storage conditions for various types of wines, watch this short video. This typically depends on the type of wine you’re storing. While white wines are not cellared for long periods of time (with the exception of the very best Graves and Sauternes), some of the finest reds can be, and are, cellared for several decades. A lot depends on the type of grape and vintage. While there are some wine glasses that appear to hold half a bottle, the standard pour is 6 ounces. This equates to four glasses of wine in every bottle. What’s the Best Temperature for Serving Wine? You can easily manage wine temps with a good old fashion ice bucket. Fill it up 4/5ths with ice, cover with water and immerse the bottle until it’s at its optimum temperature. Usually 5 – 20 minutes depending on the varietal. Whether you’re the host or bringing a bottle to a party, you want to make a good impression. If the party is a large gathering, spend at least $25 per bottle and for smaller gatherings, $45. To insure the safety of guests, keep the alcohol content 13.5% or lower and have an Uber on speed dial. 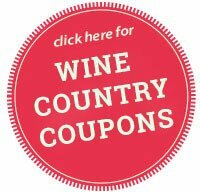 It’s a common misconception that a bottle of wine sealed with a screw cap is inferior to one stopped with a cork. But more and more, you’ll find that bottles of very good wines are being unscrewed, rather than uncorked. This is especially true for white wines and reds that are meant to be drunk young. In reality, cork alternatives perform nearly identically in ter ms of their ability to store and age wine. They’re easier to open and are a more affordable option for winemakers. But traditional corks continue to hold their allure as being more “breathable” than screw caps, and the wine inside a corked bottle continues to be observed as superior. That extra “stuff” floating around in your wine bottle may make you wonder if it’s safe to drink. But no worries, whether you’re witnessing sediment or crystals, it’s all good. While sediment forms over time mainly in red wines, crystals form more often in white wines. Harmless and tasteless, crystals are created during shipment, particularly in cooler months. The colder temperatures cause the tartaric acid found in wine to crystallize out of suspension. The crystals commonly grow attached to the cork and dissolve harmlessly in your mouth. It may seem like a bit of wine pomp and circumstance, but decanting, or pouring an entire bottle of wine into a larger glass vessel, can vastly improve a wine’s flavors and aromas. Sediment is formed when the color pigments and tannins in wine bond together and fall out of the solution. Stirring up the sediment when pouring can cloud a wine’s appearance and impart bitter flavors. The decanting process helps to separate this sediment and also aerates the wine. Older red wines, which naturally produce sediment as they age, are the biggest beneficiaries of decanting. After 5-10 years, the typical bottle of red wine will have accumulated sediment, even if you can’t verify it visually. Set your bottle of wine upright for 24 hours or more before drinking so the sediment can slide to the bottom. Hold a candle or flashlight under the neck of the bottle and slowly and steadily pour the wine into the decanter without stopping. When you get to the bottom half of the bottle, pour even slower and stop as soon as you see the sediment reach the neck of the bottle. Discard the remaining ounce or two of sediment-filled wine. Older wines, especially those over 15 years old, should be decanted no more than 30 minutes before drinking. A younger, more full-bodied red – and, yes, white wines too – can be decanted an hour or more before serving. But don’t go overboard! You don’t want to risk oxidation from too much aeration. Who has leftover wine, you ask? It may be a rare occasion but when the situation occurs, your task is to hold oxygen at bay. When wine mixes with oxygen, it quickly degrades and loses its fruity aromas and flavors. Eventually it will turn darker or browner in color and the wine will taste pretty darn awful. Refrigeration slows oxidation, but does not entirely prevent it. If stored in the fridge, white wine will still taste ok for up to five days. Red wines can be stored a little longer, although they’ll need to be brought up to room temperature for maximum enjoyment. From devices that help remove excess air from a wine bottle, to others that allow you to pour your favorite wine without pulling the cork, there’s no shortage of contraptions and systems designed to help keep your wine fresh for days after pouring. But one of the simplest things you can do is pour your leftover wine into the smallest, airtight container possible, cap it, and refrigerate. Blot the stain: Clean up as much of the excess wine as you can. But don’t rub, just dab or blot. Soak the stain in water: Completely soak the stain with cool water. This prevents the stain from setting. Cover the stain with salt: As it soaks in the cool water, cover the stain in salt until you can’t see it anymore. The salt should start to turn pink as it pulls the stain out. Remove the salt after it dries and cakes. Rinse the stain with hot water, throw the garment in the wash and launder normally. If this method doesn’t work, try soaking the stain for at least an hour in a mixture of one part white vinegar to two parts water. Launder normally. Another option is to keep a bottle of “Wine Away” handy. If sprayed on fabric immediately following a wine spill, most of the time the stain should disappear instantly. However we have found that in some rare instances the stain has not diminished greatly but not disappeared completely. Areas designated as official wine growing regions by the Bureau of Alcohol, Tobacco and Firearms are called American Viticultural Areas or AVAs. The Paso Robles AVA, established in 1983 and expanded in 1997 and again in 2009, is the fastest growing and largest of the three AVAs in San Luis Obispo County. The Paso Robles’ appellation (a term often used to describe an AVA or sub-section of an AVA) comprises of 614,000 acres that lie on the inland side of the Santa Lucia coastal mountains and roughly forms a rectangle 35 miles from east to west, and 25 miles from north to south. 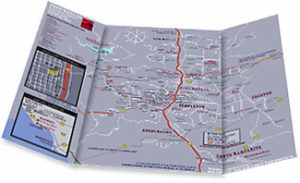 It extends from the Monterey County border to the north, to the Cuesta Grade below Santa Margarita to the south, and from the Santa Lucia Mountains to the west, to the Cholame Hills to the east. When an AVA is designated on a wine bottle label, 85% of that wine must come from the AVA. Refers to the year in which the grapes for any particular wine were harvested. Typically a vintage wine will include grapes only from the vintage specified. Non-vintage wines are generally blends of various vintages. A “variety” is one specific type of a grape, i.e. Zinfandel grapes, Chardonnay grapes, etc. A “varietal” is a wine made from only one grape variety as opposed to a blend of multiple varieties. A wine labeled as Zinfandel or Chardonnay, for example, is a varietal because it is produced using only one type of grape.